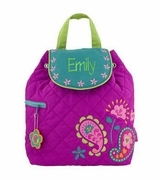 This years popular back to school backpack features the quatrefoil pattern. Beautiful in a pink and white design. Plenty of outside and inside pockets, side mesh water bottle holder, and inside front zip pocket for pens, pencils and id card. 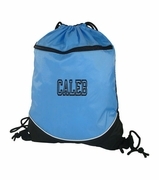 Aqua quatrefoil backpack measures 17" height, 12" wide and six inches across bottom and constructed of nylon micro-fiber. Water resistant and easy clean exterior. Matching accessory pouch and lunch tote WB-M380SADIE available. I bought this backpack for my 12-year old daughter and she loves it! She loves the color and the embroidery. She did want to order the small pencil pouch with it, but we couldn't find it to place an order. Highly recommend.